BDD has no new content today as we have not yet received instruction from the Head of the Red-Sox-NESN-New-York-Times-Company-Boston-Globe-WEEI Cartel that the Boston Herald's Howard Bryant exposed* to the world yesterday. If any of the other cartel members got today's memo, please forward so we can carry out the not-so-secret agenda. Thank you. *Boston Herald, Wednesday, April 27, 2005 -- Howard Bryant/Boston Uncommon -- Sox can't change history -- "The Red Sox are part of a growing synergistic cartel that maintains addresses at Yawkey Way, Morrissey Boulevard and Brookline Avenue (NESN's headquarters). The New York Times Company owns the Boston Globe, and a piece of the Red Sox, which owns NESN> The Sox are also business partners with WEEI, the most influential sports radio station in the region. That means that the cartel not only has the means, but a financial interest in controlling information. That includes history. Boston has always been known for its insularity, but such naked consolidation is a little too cozy to be acceptable." (Medfield, MA-April 28, 2005) SHADE Foundation of America's SunWise poster contest in New England is reaching thousands of students under the age of 17. In its second year in New England, the poster contest aims to make kids and teens aware of the dangers of over exposure to the sun and the simple steps to practicing sun-safety. The contest calls for teachers to encourage students to creatively depict skin cancer prevention in an 8 1/2" x 11" poster. One winner will be chosen from each of the New England states. A grand prize winner will be selected among the New England winners. The Grand Prize winning artist will have his or her photo taken with Boston Red Sox pitcher Curt Schilling and will throw out the first pitch at Fenway Park on June 4, 2005 when the Red Sox play the Los Angeles Dodgers. Each New England state winner will also have his or her photograph taken with Curt Schilling and receive two tickets to the game. Each state winner will also compete in a national online competition beginning July 5, 2005, which encourages people to select one national poster contest winner online. The artist who wins the national prize will receive a trip to Disney World in Orlando, Florida. 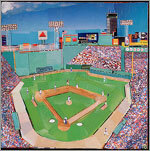 The teacher of the winning artist will receive two tickets to the Red Sox game. "An Environmental Protection Agency statistic states schools engaging in sun-safety programs have an 11% decrease in sunburn cases, a very encouraging statistic," said Shonda Schilling, melanoma survivor and founder of the SHADE Foundation. "Each year the number of contest entries increases, demonstrating the number of students who we are reaching with our sun-safety message." Statistics indicate one in 5 children will develop skin cancer in their lifetime. Educating kids about the need for SPF 15 sunscreen, wearing sunglasses, hats, long sleeves and avoiding the sun during prime sun hours of 10am and 4pm is instrumental in preventing future cases of skin cancer. Shonda Schilling launched the SHADE Foundation in 2002 after undergoing 5 surgeries to remove malignant melanoma, the most deadly form of skin cancer. The annual poster contest was first created by Schilling in 2003 in Phoenix, Arizona when her husband, Curt Schilling was pitching for the Arizona Diamondbacks. When Curt Schilling was traded to the Boston Red Sox the contest traveled cross country with the Schillings. "The tremendous response we received last year in Boston from the poster contest proved that kids were eager to participate. If they are drawing the message, we know they are learning the message. This year we are proud to be running the poster contest in 10 states reaching students about skin cancer prevention," said Shonda Schilling. "You can limit the sun without limiting the fun." Entry forms can be downloaded from the SHADE Foundation website at www.shadefoundation.org Posters should be mailed to Boston Red Sox SunWise Poster Contest, PO Box 859066, Braintree, MA 02185-9948. Posters must be postmarked by May 9, 2005.